The weatherman warned of rain on Saturday, but it was not to be. Although a bit drizzly when I first got up, by the time I left the house the sun was breaking through the clouds. I picked Melissa up early (go visit Melissa and see the gorgeous yarn she spun), because the plan was to meet some of the other PDX Knit Bloggers for breakfast at the Hawaiian Cafe, conveniently located right next to the barn. 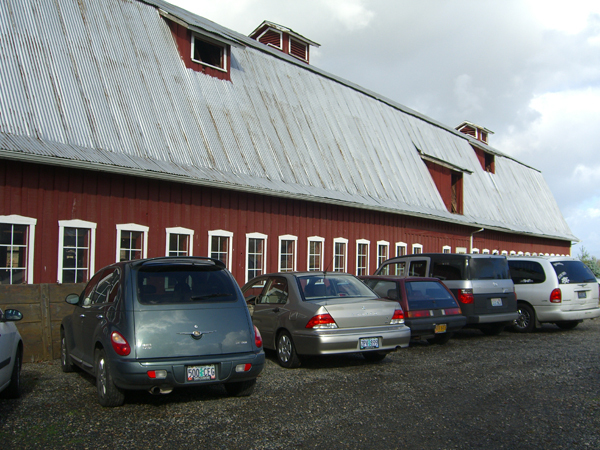 This is the outside of the barn. I want you to see this picture, gentle reader, because I want you to note the sheer size of this place. Breakfast took a little longer than expected. And then I needed to move my car so restaurant patrons could park. And then the lot by the barn was full and I had to turn around and park between the barn and the road. And all this means it was about 10:15 before I actually stepped foot inside the barn. And this was what it looked like inside at about 10:30. Already things were beginning to be a little picked over. 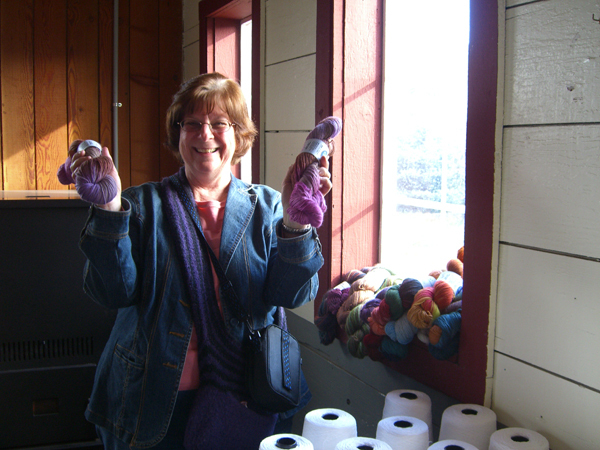 And there was a scad of stuff and another scan of knitters there breathing in the yarn fumes. There were tables down both of the long sides of the barn. To the left of the camera, the tables held cone yarn, books, and a few snacks lest we become faint from hunger (not much chance of that for me after a humongous breakfast at the Hawaiian Cafe). 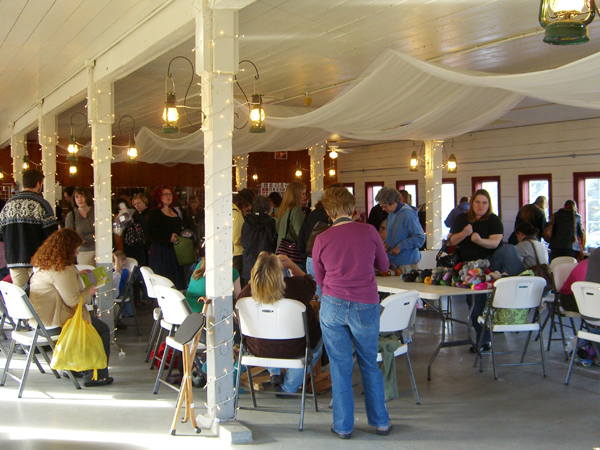 The tables on the right side held grab bags, sheep-to-shoe kits and roving. In the back are racks (it looked like the same racks used at OFFF) holding tons of sock yarn, laceweight, silk, bamboo, mohair, just tons of stuff. And twirly racks of sock yarn, too. People just sort of grabbed stuff willy-nilly and then went to the tables in the middle to sort out what they had. I want you to pop up this picture and look at the pile in front of the woman on the right towards the middle. Go ahead. I’ll wait right here. Yes, that was a typical haul. That’s Tina sitting to the right of the pillar with her back to the camera, taking it all in. This is Pat from Longview (sadly blogless). Her selection is on the windowsill next to her. You can see why she looks happy. By the time I finished chatting with Pat and got in line to pay, the lovely Blue Moon ladies had run out of the big plastic tote bags, but offered a couple of the small bags for my purchases. I think they later ran out of those as well. When we left around 11:00, there wasn’t much left but there were a lot of happy knitters. And this is my selection. I was very careful. I didn’t want to load up on sock yarn. 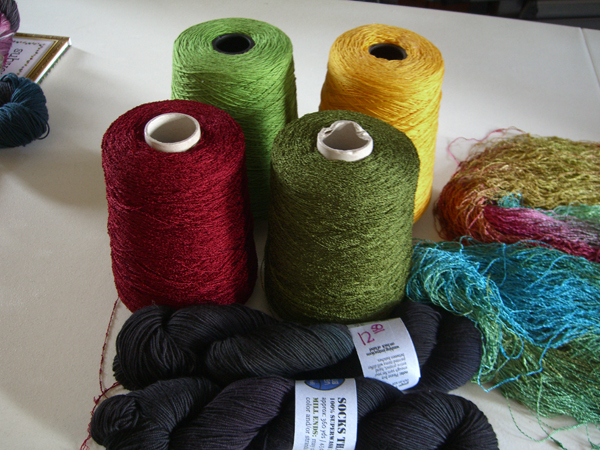 I looked for cone yarn and unusual fibers in largish quantities. I also bought a sock-club t-shirt, mostly because the back says Notorious Sock Knitters. Who could pass that up? The cones in the back are 100% cotton. The green on the left is called Quince and the sunny gold on the right is called… Golden Sun (go figure). The cones in the front are a 100% viscose mini-boucle. On the right is Black Cherry and on the left is Moss. Pictures do not do justice to the way that red simply glows. When full, each of these cones holds more than 2000 yds. I have no idea if I have full cones or not, but I do have enough to do something really nice with. I have not yet decided what. Stay tuned. In the front are two lightweight STR that are marked as mill ends. I think they might be slightly off color Ravens. The one right in front is black with hints of blue and purple, and the other is black with hints of teal. When I picked this yarn off the rack, a knitter standing next to me said but it’s black! I replied No it’s not! and held it in the sun streaming through the windows. OH! she said, and started selecting a few skeins herself. The yarn to the right of my cones belongs to the famous MonicaPDX who shared my sorting space. I will let her tell you about it. Go visit her, where I sure she will post a blow-by-blow. Vocations which we wanted to pursue, but didn't, bleed, like colors, on the whole of our existence.